It's back! 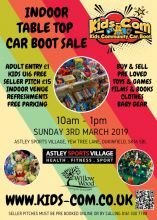 Our indoor car boot with everything for kids! Our first Kids Com Car Boot of 2019 is back - and with anything and everything for babies, toddlers, kids and teens it's sure to be as popular as ever. There'll be pre-loved clothes, toys, games and much more. If you're buying, entry is just £1 (free for under 16 years), and with free parking and refreshments available it's a great opportunity to stock up on gifts and essentials alike. If you'd like to book a pitch, they are just £15 - book online below.